← ArtWorks 2012: What’s in a Name? Joán Miró (Spanish, 1893–1983), The King's Jester (Le Fou Du Roi), 1926. Oil, pencil and charcoal on canvas; 45 x 57 1/2 in. Milwaukee Art Museum, Gift of Mr. and Mrs. Maurice W. Berger M1966.142. Photo credit John Nienhuis, Dedra Walls © Successió Miró / Artists Rights Society (ARS), New York / ADAGP, Paris. Since Easter is Sunday, I thought it would be fitting to write an Easter-themed blog post for the occasion. But other than choosing a piece of art depicting the crucifixion of Christ, I wasn’t exactly sure how I could approach the topic. Therefore in the spirit of Easter egg hunts I have decided to make a two-fold hunt of my own to find out more about pieces in the Museum’s collection as well as creating a post that is related to the holiday. Let’s use a little game by the name of “Six Degrees of Kevin Bacon” (or more simply “Six Degrees of Separation”) to relate a non-Easter-themed work of art to the holiday! For those who are unfamiliar, “Six Degrees of Separation” is an association game. The objective is to link any one person with any other person in the world – or to Kevin Bacon in the Bacon version in as few moves as possible. For this round, I’m starting with a painting I noticed in the Museum gallery and was drawn to – The King’s Jester (Le Fou Du Roi) by Joán Miró (pictured above). Miró, 1893-1983 was born in Barcelona, Spain. This mixed media piece in the Museum’s Bradley Collection on view on the Upper Level is oil, pencil and charcoal on canvas. One of the most striking things about this artwork is that the canvas is a natural color and much of it is exposed – left without paint. This fairly large work sits in a thick, dark, wooden frame, overlooking the lake. The figure’s oblong, asymmetrical head teeters on a thin neck and narrow, sloping shoulders. Its eyes are set far from one another – one smaller, painted black; the other larger, scribbled in pencil. A thin line represents the mouth and paired with the mismatched eyes and lack of nose makes the figure seem vacant, if not a little bit sad – an emotion contrary to what we might expect of a jester. Upon its head is red crown that suggests flames of perhaps a rooster’s comb. If we don’t take it for granted that the Jester’s crown mimics a rooster’s comb – and simply view it as a crown, we could extend associations by identifying the shape as being similar to another one of Miró’s sculptures in the gallery – Project for a Monument (Moon, Sun and One Star). This bronze sculpture (at right) is a series of shapes built on top of one another, not unlike a totem pole, with a four pointed crown shape atop a thin rod similar to a weather vane. 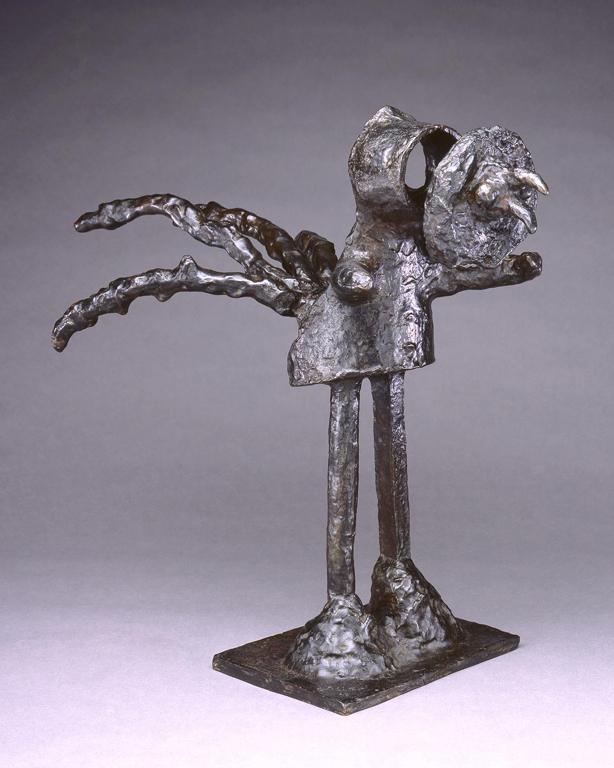 Directly across from that sculpture is another work by Miró – The Rooster [Le Coq]. The Rooster is almost anthropomorphic, with legs and arms and what appears to be a garment covering its body. A feathered tail and strange disconnected, almost floating disc reveals what could be the features of a roosters head. When viewed in this proximity it is difficult not to acknowledge the likeness of the crown shape to a rooster’s comb. Using the crown/rooster’s comb there are several jumps I could make to get us from Miró’s surrealistic jester to Easter in both a Biblical and secular sense. If we do a secular association, roosters were once chicks and chicks are right up there with bunnies as far as secular Easter symbolism goes. Not to mention that roosters come from eggs, another largely popular Easter symbol having to do with rebirth and spring. Jester to crown, crown to Jesus – “King of the Jews” (crucifixion, death, resurrection) as Easter. Jester to crown, crown to rooster, rooster to chick, chick to Easter – four steps from Miró’s Jester to secular symbols of Easter. 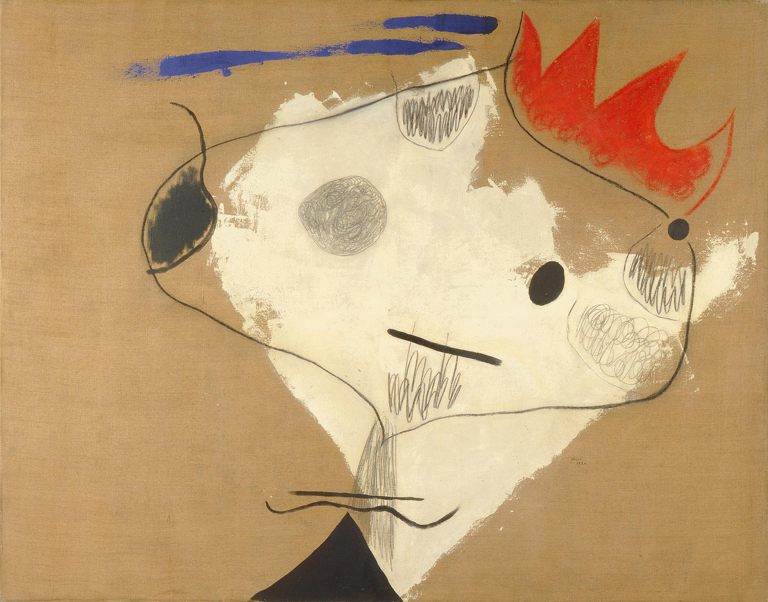 Despite appearances, my interest in Miró and his work has absolutely nothing to do with Kevin Bacon or Easter really, but rather, how art can activate our imagination – appear and reappear to bring two otherwise unrelated things together. It just reminds us that there is no wrong way to experience art, or connect art. And you always get bonus points if you can bring the artwork back to Kevin Bacon. This entry was posted in Art, Curatorial and tagged easter, Holidays, Interns, Joan Miro, Six Degrees of Separation. Bookmark the permalink.